After Trudy’s funeral last week several of us decided a charity quilt would be a good thing to do. As the Blue Nurses helped Trudy stay at home where she wanted to be, and had been her favourite charity we decided they should be the ones to benefit. 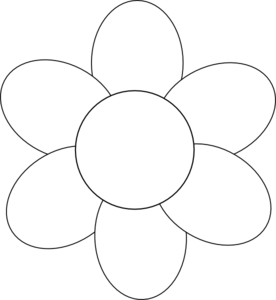 So… all who are interested – we will do a block 10″ finished (so hand it in at 11″ or over) based on a simple flower (ie a centre and 5 or 6 petals. I’ve attached a flower drawing as a guide but you don’t have to be totally rigid to this design. It’s just to inspire you!). As her favourite colours were red and orange they will be the main colours. You can do a block any way you like – pieced, embroidered, appliqued – whatever you like. If you need a foundation fabric please call me and I will supply it for you (so then all the backgrounds will be the same). Obviously if you are doing a pieced block you won’t need this background. Similarly if you don’t have any reds or oranges in your stash give me a call and we’ll sort you out. We’ve put a deadline for finishing the blocks at 31st May to give everyone time for inspiration and assembly. When they are all finished we will put them together in a quilt and donate it to the Blue Nurses so they can raffle it and raise funds for their organisation. I think this will be a postive thing for our group and will be a fitting tribute to Trudy so make sure you register to be included. I will contribute a block on red background with a carnation (Trudy’s favourite flower) sashiko stitched on it. Could even manage two if I set my mind to it and can find another inspirational flower to stitch. People talk about six degrees of separation. One of my great aunt’s, on my mother’s side, helped start the Blue Nurses in Ipswich, Queensland and held an annual fete in her lovely garden. A cousin of my father’s wrote a history of the Blue Nurses in Qld, Neither knew of each other. May 31st is heaps of time Kaye, I will definitely get mine finished by then! This is a lovely idea and I am looking forward to stitching something that is not in my usual colours in tribute to Trudy.